Less than two weeks after the last post, there is more happy news to report. 1. Nigel Delaney‘s PLoS One paper came out yesterday that describes the end result of an extended effort to push Methylobacterium culturing as far as possible. It reports a new optimized medium, new strain lacking cellulose synthesis that caused clumping, and conditions and methods for high-throuput, robotic culturing that takes advantage of our earlier JALA paper describing software to run automated lab systems. 2. 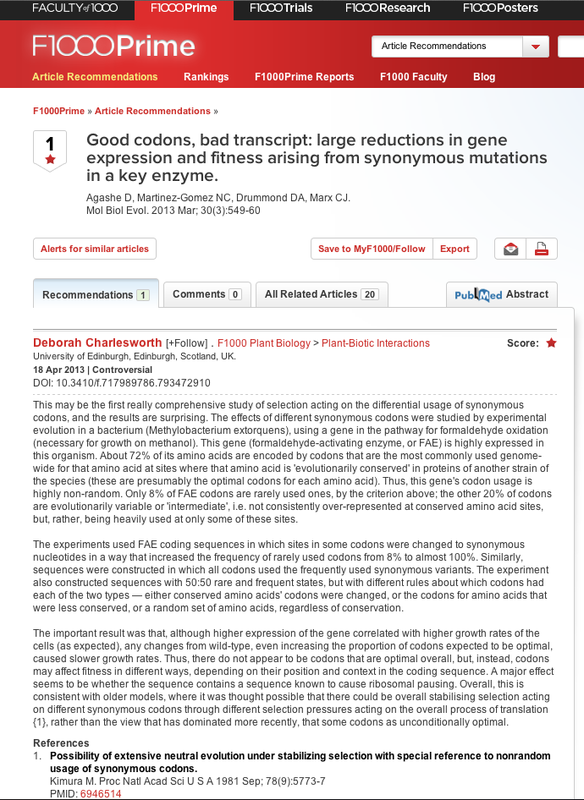 Deepa Agashe‘s Molecular Biology & Evolution paper demonstrating tremendous selection upon codons was recommended in the Faculty of 1000 by Deborah Charlesworth. 3. Best of all, I am so thrilled to pass on that my PhD advisor, Mary Lidstrom, was just elected yesterday to the National Academy of Sciences. What a tremendously well-deserved selection for an incredible person. If nothing else, I have done well in choosing stupendous mentors: undergraduate work with Penny Chisholm, PhD with Mary, and then postdoctoral work with Rich Lenski. And now all three are in the NAS! This entry was posted in publications, research on May 2, 2013 by cmarx2014.